I really love making cakes (as if you had not already guessed! ), but I have not made many themed celebration cakes. It is not because I do not have the ideas , I have plenty, it is just that I am no good with using fondant icing having not had any training or much practice, which is why I shy away from making elaborate character cakes. Therefore, when offering to make a special cake for someone’s birthday, I attempt my own style and prefer to use lots of frosting and sweets – afterall sweets can cover up many cake making mishaps! Last month, a friend of Burton’s celebrated her 4th birthday and wanted a princess castle cake and wanting more practice at making celebration cakes I asked her Mum if I could make it for her because she was going to get a professional to make her one. Now, don’t get me wrong I am NO cake making professional but I am cheaper and full of enthusiasm so I won the ‘gig’ lol. I have a copy of Birthday Cakes for kids by Anne Rigg which shows step by step instructions of how to make a castle cake , which I used as a guide. 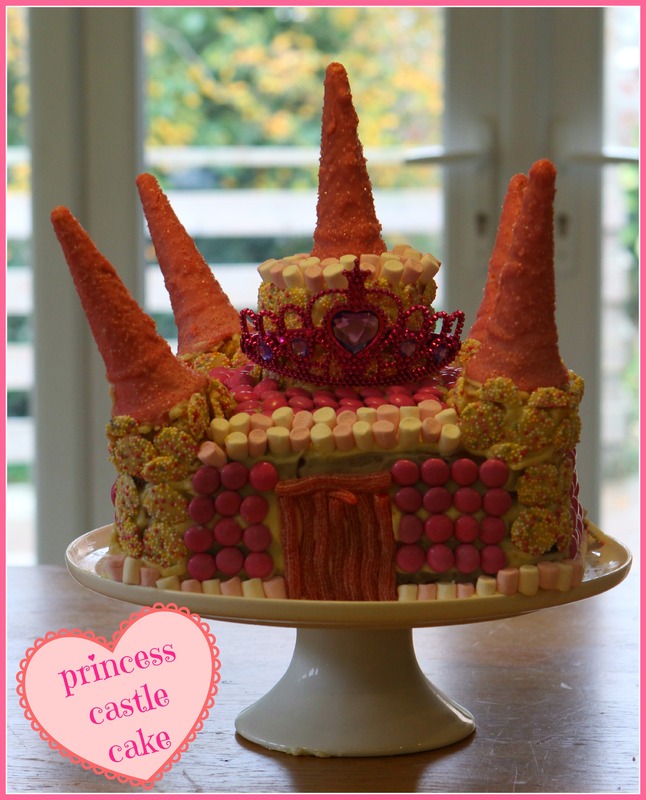 I used my own sponge recipe and made pink coloured sponges- perfect for any budding princess! The cake was constructed and covered in a white chocolate cream cheese frosting and then heavily laden with pretty chocolate sweets and I made turrets from ice cones covered in pink chcocolate, and for a finishing touch I added a princess crown for the birthday girl to remove and wear as she feasted on her cake. Carefully fold in the flour (sifted) and the pink food colouring and mix until all combined and the batter is a lovely pink colour. Sandwich 3 of the sponges together the cake together with the frosting and then cover all of the cake with the frosting. The carefully cut the fourth sponge to make the shapes required for the turrets (see picture below) and stick each one to the top sponge. This was quite tricky to achieve ! 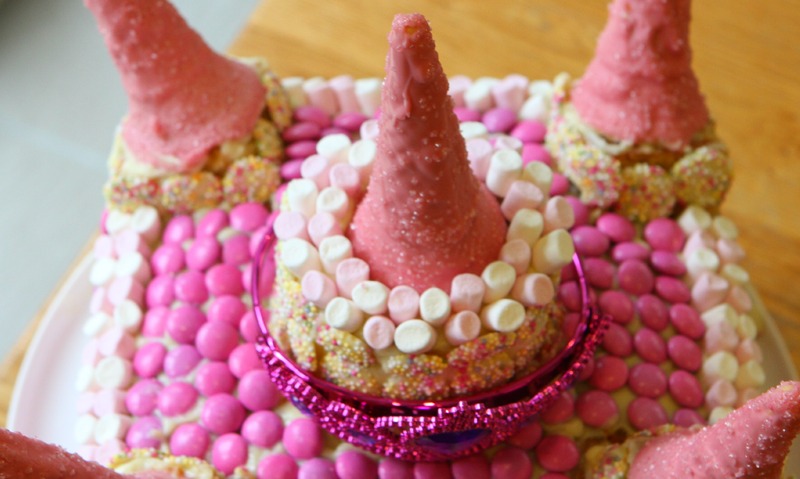 Then you need to add the pink turrets to the top of each sponge turret and hope they stay in place! I placed mine in the fridge at this point to help it set - but only for 10 minutes as I still needed the frosting to be sticky to allow the sweets to be stuck to it. Then i added lots of sweets to make the castle entrance, and decoration. I may have gone a little OTT but as I said before sweets can cover up mistakes!! I then added a toy crown as an extra touch for the birthday girl. The cake is not bad for a first attempt – but there are things I would prefer to be different! I really wish the turrets had not been so wonky! I tried and tried to make them stand up straight but they would not have it! 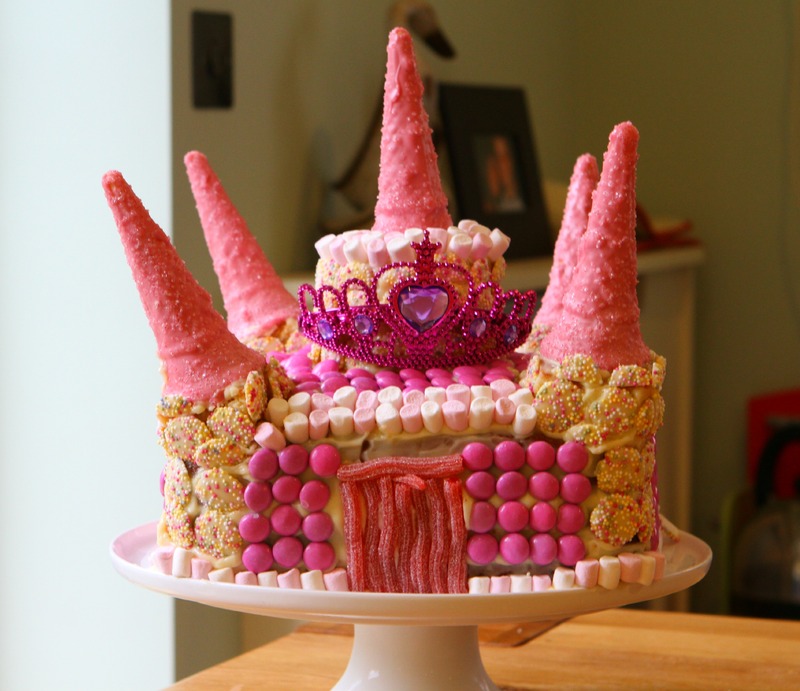 I also wish I had made the amount of pink smarties either side of the castle entrance equal – it bothers me that I did not notcie this when I was assembling them! Still, the birthday girl, her parents and party guests were pleased with it and that is what really matters. So what have you been baking this week? Don’t forget until November 30th Helen and I are inviting you to link up a recipe inspired by the GBBO 4th series please join in, baking is fun and tasty!! So now it is over to you …………………………………. on your marks, get set and baaaaaaake!!! Jenny this is just amazing! I want to pick off one of those sweeties right now! You are so creative. wow! wow! this is amazing! This is one of those cakes that’s every little girls dream 🙂 a proper princess castle. 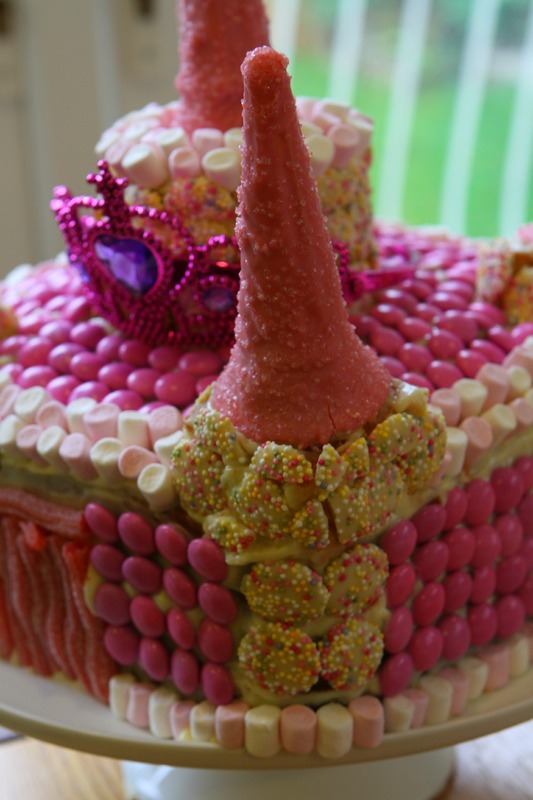 I think the turrets look fab (I wonder if lolly sticks in the cake for them to rest on would help them stand straight?) but it looks gorgeous just as it is anyway. Thanks for linking to Celebration Cakes And Bakes.